This weekend I made some Chicken Lettuce Wraps (we ate them as a meal) and they were DEEEEElicious! So, I feel the need to share the recipe: http://www.onelovelylife.com/chicken-lettuce-wraps/. For good measure though, I went heavy on the fresh ginger and garlic and I think it was just perfect that way. One garlic clove is NEVER enough! Also, it is very difficult to find organic or pasture raised ground chicken. You can grind your own very easily though. I just cut up the organic chicken thighs into chunks and then froze them for a couple of hours. Then, when I was ready to make the meal, I threw the chunks into my food processor and voila--I had ground chicken! You can read last week's post for our typical breakfast, snacks and lunch plan. I need to share a yummy breakfast recipe that we have been eating for the past few days. These apple carrot breakfast cookies from "Super Healthy Kids" are just perfect. We absolutely love them! They are a super easy breakfast and snack and are packed full of vegetables and fruit. And, they have no added sugar at all---the fruit sweetens the cookies nicely and the cinnamon make sugar completely unnecessary. If you wanted to make them gluten free, just grind some oats into oat flour instead of using the whole wheat flour. Monday: We actually have plans to eat out with friends tonight. A local farm to table restaurant has a kids eat free night on Mondays, so that is a bonus! But, before we made these plans this weekend, I was planning on making what I am making on Tuesday night--the Chili. That meal feeds us for several nights (or a couple of dinners and a couple lunches (for me)! 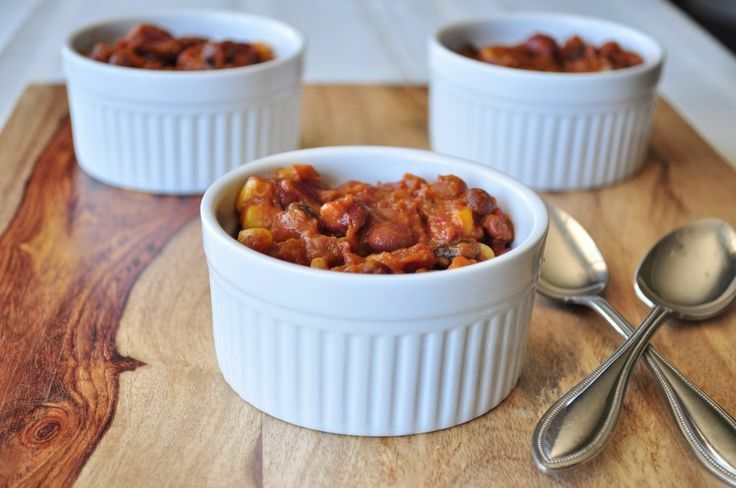 Tuesday: Amazing 3 Bean Sweet Potato Chili from "My Whole Food Life". This recipe is very simple and delicious. Plus, it is Vegan and gluten free--so it is a great "Meatless Monday" recipe. Serve this with some clean organic tortilla chips. We like the Central Market Organics Blue Corn tortilla chips. Thursday: Pakistani Kima: This one is a regular hit at our home. We have it at least once per month. The seasonings make this dish delicious! I have tried it with chicken, but it is much better with beef. Also, I usually use 1.5-2 large sweet potatoes as the potatoes in this dish. When making this recipe, the first thing I do is dice the sweet potatoes and stick them in the oven (coated with a bit of olive oil) for about 20 minutes while I am doing the rest of the recipe. Then, when it is time to add them, they are cooked through. Otherwise, it takes a while for sweet potatoes to cook in the skillet with the other ingredients in there. I serve this one pot meal with brown rice. 1. Melt coconut oil or butter in a large pan. 2. Add onion and garlic (if using minced, add a bit of water to reconstitute). 4. Add meat and cook thoroughly. 5. Add curry, salt and spices. Stir well. 7. Add potatoes, tomatoes and peas to the pan. 8. Bring to a simmering boil. Reduce heat, cover and simmer for 25 minutes, or until potatoes are done. For a low carb option, sub green beans for the peas and cauliflower for the potatoes — any low carb option you like. How about radishes for the potatoes :)? Dice, chop and throw everything into a big bowl and mix together! I think the flavors come out more if you refrigerate it for a couple of hours, but it can be eaten right away.